uBuyFurniture has a large selection of rectangular activity tables and rectangular activity table sets sets to help you complete school , recreation center, church, or office. 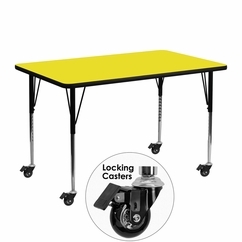 We have activity tables in many sizes, styles and colors. All activity tables ship FREE within 1-2 business days. Like us on Facebook, follow us on Twiter and check out our Blog for more news and offers! © 2004-2014 uBuy Furniture, Inc. All rights reserved. Yahoo! Store Design by Solid Cactus.